in hard numbers (amount of data downloaded or uploaded per second). Speedtest is online service that provides bandwidth test with numerous servers across the globe and extensive statistics. Speedtest loads fancy Adobe Flash page that allows you to choose server and test your connection. Geographically closest server will be offered by default and it is best to go with it (unless you want to see how jumping across the globe slows those bytes). It measures download, upload and ping values. Results are saved (by IP address, no registration required) so if you have static IP you can see how your connection gets better or worse over time. what speeds are average for whole continents, countries and specific cities. Speedtest compiles you results in badge-type image and provides a link to share it easily. Simple and nice feature, equally useful for boasting and troubleshooting connection issues. While giving good speeds estimate online tests are far from completely accurate. There are plenty of services online but I think Speedtest has important advantage of providing numerous servers spread geographically. I used to measure Internet connection with the DSLReports Speed Test ( http://www.dslreports.com/stest ), but I’ve switched to Speedtest.net over one year ago. 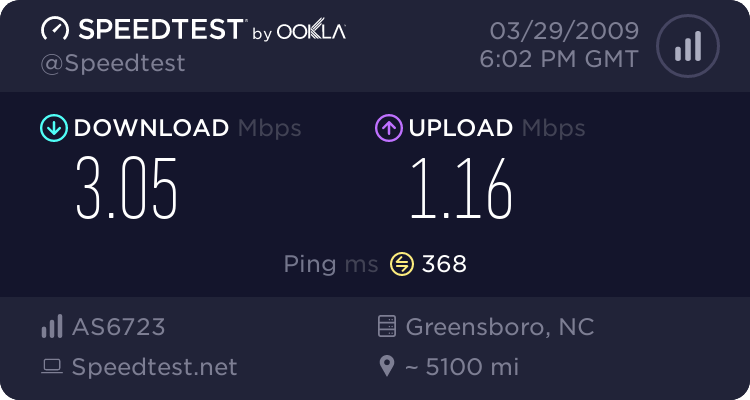 Tests revealed that Speedtest.net is the most reliable services available today.